This is probably not the way to go to start out in RC model flying. As it takes to long to get in the air. I also bought an ARF so I could be flying while I was building the apprentice. I also love to build them. G'day. Looks like a really nice model. Congratulations. It is nice to see someone building from basics. What is powering the model? It looks like a Graupner Taxi that I had many years ago. It was build from a kit for an OS 29, had a wingspan of about 60 inches and although I never flew it, the people that did said it flew well. I am in the process building from Model Builder Magazine plans (mid 1980's?) the Big apprentice 8' wing span. Bob Benjamin wrote also the accompany instruction with the plans. He cites in his opening: "the Big Apprentice is an enlarged and redesigned`version of the original Apprentice R/C trainer designed by Bill Northrop, in 1968 issue of Model Airplane News." Mr.Benjamin cites also why to stay with no ailerons as a trainer. pictures of your big Apprentice when it is done. I built 2 of these in the 70's (I was a slow learner) powered be an Enya .35 as I recall. With that wingtip washout you could walk beside it in a fly-by. The last one did its last steep final only because the wing retaining rubber bands gave out. I loved it. Can you still get the plans? I'd love to do another one for our club. 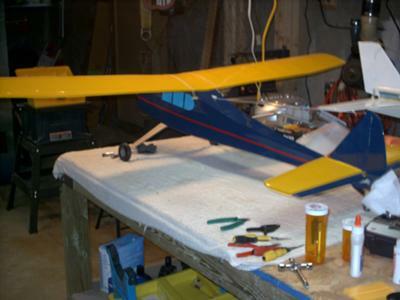 The plans come from "Model Airplane News" plans service at there website. Great plane. Build one about ten years ago still flying it. and a 12/6 prop. Climbs straight up and fun when bending the sticks. I have seen one on floats. Also would like to build aileron wing for it. I have raised the trailing edge of the wing 1/4 inch. The stock setup tends to climb. so be carefull with that. This is the kind of aeroplane that, after my Gentle Lady 72" wing span powered/glider training, I think would be the next logical step for a second plane and green pilot. I like the stable flight that could reasonably be expected with a wing~over. She's all lift and can fly fine on half throttle with a 0.40 cubic inch ringed engine. She's designed to be light, fly slow, yet with full power could become a bit dicey and fickle on the sticks. With a few mistakes high, if trouble overwhelms the young pilot simply throttle back into glide mode and recover. Ease power back on and do not forget to take a deep breath and relax. Looks like fun and could easily be used to 'shoot landing approaches' time and time again. Additionally doing away with the wing ailerons only makes flying less complicated but teaches the use of both rudder inputs, which generally causes a loss of altitude, and coordinated elevator inputs to raise the nose to counter this altitude loss. I mean just look at this airframe. I luv's tail draggers. What part of it doesn't scream "fly me"? And what about scratch building this aeroplane from plans? Well it is easy to cut-sand-pin-and glue this bird together. Skinning it with iron on, or paper and dope takes care. But teaches that 'it's not possible to make a mistake' Just cut the wrinkle out and re apply more covering. Remember, from in the air, it's not possible to see the flaw, and this aeroplane will still fly just fine. What about the inevitable dink into the ground? Well, you built it, you can fix it. Which is what's wrong with 'rubber duck' RTF 'kits'. There are only two kinds of crashes. The first is walking out to the field to pick up the plane and a few things that became 'fodder'. The other is when one calls back for the blanket and scoops up the whole plane, re-kitted. I think I just talked myself into building one of these. Craig skip Weis, Sturgeon Bay, Wisconsin. Once a few flights are under your belt this Apprentice aeroplane can be a blast to play with. Take a Styrofoam drink cup and force a Popsicle stick through it's bottom and rubber band that cup over the top-O-wing and then place a day-glow orange egg in the cup. Go out and practice egg drops. Either roll the plane over or fly 'up-down-up' and the egg will drift out of the cup, hopefully falling near the target. I dropped one two foot in front of me! Or trail a length of cray paper behind and try to evade a buddies plane who is trying to chop off your paper tail. Mid-airs are really hard to make happen but they do happen...that's just a warning. I build my Apprentice in 1981, from plans that I bought from America, I'm in Australia, by the way, that was not only my first plane built from scratch, but also my first plane. I learnt to fly with the Apprentice, I have an OS Max 25 FSR on it, the engine is just about worn out now, but I will never part with it. It's is easily the best trainer you can get, in my humble opinion, as it is inherently stable, once it is trimmed, it will continue to fly, straight & level, until the idiot with the radio upsets it, but release the sticks & it will go back to straight & level once again. Nice looking airplane. I have the January 1987 copy of Model Builder with the "Big Apprentice" construction article by Bob Benjamin. It is 3 channel with a 96 inche wingspan, 1065 sq. in. @ 9 to 13 lbs. EngineS were a 60 - 90 4-strokes or .45 -.60 diesels (Davis conversion). I called Bill Northrop's Plan Service several years ago. He said the "Apprentice" flew better. I must have read that article 30 times. I love the "Apprentice" One day before I go blind... Happy flying. The Academy of Model Aeronautics Plans Service carries both airpanes. I'd just like to say that's a nice looking aeroplane. If it looks right it flies right. Bill Northrup published, in Model Builder, a biplane version of the Apprentice trainer, very early in the 1970s, plan #11712.... exact same wing - no ailerons - apart from the top wing having a bit of rear center section cut out, like you see on early scale biplanes.... the fuselage was different: two seater, one behind the other and wire fuselage cabane supports for the upper wing, stab a bit larger. I suspect it was not hugely popular as "trainer". I like some of the fuselage structure of Big Apprentice - the stick construction especially - and will use it when I build a couple of fuselages - one electric, one glow (probably for an OS 40 four stroke) - as I still have two wings for the original Apprentice build back in the 1970s.